eight + = eleven Required Please enter the correct value. The list of the best marijuana penny stocks to buy in 2019 becomes more and more attractive every single day. You see, the wave of cannabis legalization seems uns toppable. In the past 12 months, we've seen full legalization in Canada as well as sweeping legislation in several more U.S. states. The hope is that this will also pave the way for the United States to follow the example of its neighbors to the north. Mexico even announced on Oct. 31 that it was going to pursue fully legalizing cannabis. In the November midterms, Michigan voted for recreational legalization while Utah and Missouri passed laws allowing medical marijuana for the first time. Of course, not all pot penny stocks are worth your time or investment dollars. Now, we're bringing you 18 ways to bank even more profits in 2019. That's why we are going to give you our list of the three best marijuana penny stocks to own now. These stocks are poised to skyrocket as the trend in legalization continues into 2019. 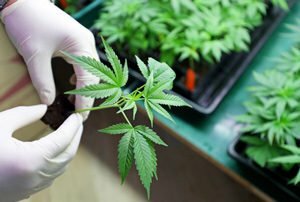 These are three companies that are on the cutting edge of the cannabis market and are developing unique ways to generate revenue and profits for shareholders. Easton Pharmaceuticals Inc. (OTCMKTS: EAPH) is a Toronto-based pharmaceutical company that specializes in designing, developing, and marketing various topically-delivered and therapeutic healthcare products. It was founded as LAM Industries in 1997 and switched its moniker to the current name in 2010. The main products that the company produces include Viorra, a topical gel to treat sexual dysfunction in women, Kenestrin for treating arthritis in elbows, Renou HA, a wrinkle cream to hold off the aging process, and Nauseasol, a gel for the treatment of motion sickness. The company also has a product under development called XILIVE, which is an early-stage cancer treatment. Easton is also considered a play in the medical marijuana space. Benzinga reports the company has been working on a $1.3 million acquisition of the Alliance Group, which is a Canadian cannabis company. Easton has paid $575,000 to Alliance for the deal, giving it a 30% stake in a cannabis growth and production operation that spans 135 acres. Until this facility is capable of generating revenue, Easton will also be entitled to 50% of the revenue that Alliance produces from its other sectors. Easton still hasn't clarified whether it will be using its portion of the marijuana grown at the facility to create its own products or will sell it to other companies. But now that full legalization is in effect in Canada, this stake in the cannabis space has become even more valuable. Easton also has its hand in a variety of real estate deals on a global scale. It has recently acquired a casino resort in Greece and a boutique hotel in Toronto. In Dec. 2018, it closed a $30 million real estate acquisition in Toronto and contracted to build 150 homes in the area in Jan. 2019. Shares of EAPH have traded between $0.008 and $0.03 over the past 12 months. Considering everything that this company is involved in, these are bargain prices. Best Marijuana Penny Stocks to Buy in 2019, No. 2: 22nd Century Group Inc.
22nd Century Group Inc. (NYSE: XXII) is a New York–based plant biotech company and one of the most unique pot penny stocks you can own this year. The company creates plants that have lower levels of nicotine through the application of advanced engineering technology. 22nd Century has achieved something incredible by producing tobacco that has about 97% less nicotine content than the traditional plant. Since quitting smoking and cutting back on this addictive substance is a high priority for many, these products can help smokers wean off of the drug and reduce their exposure to dependence. The tobacco alternative products market is exploding, with a value of $2.9 billion in the last year alone. The technology that the company uses for tobacco is also available for other plants like marijuana. You see, U.S. hemp farmers are under a tremendous amount of pressure to produce plants that only contain the federally allowed minimum level of THC. If the plant has more than permitted, it has to be destroyed. XXII is using its methods to help these farmers achieve these benchmarks. Grand View Research reports that the global hemp market is going to be valued at $10.6 billion by 2025. XXII shares are currently trading at $2.26. This is another affordable pot penny stock worth owning in 2019. Very interesting. How does one purchase shares in various "penny Stocks" for marijuana products? I would love to get into this as I already know that this is the new product for the country.